Since at least 1000 years before the birth of Christ, the handkerchief has been used to collect tears of joy, hope, happiness and sadness. One small cotton square can hold a wealth of memories. Throughout history, hankies have been created and celebrated, whether for the royals or the common people, handkerchiefs have been used to celebrate weddings and births, as well as comfort in grief. Providence Place has a beautiful selection of handmade handkerchiefs by local artisan, Vicki Arnold. Hankies make a wonderful wedding day gift for the bride, bridesmaids, mother of the bride, mother of the groom and grandmothers. 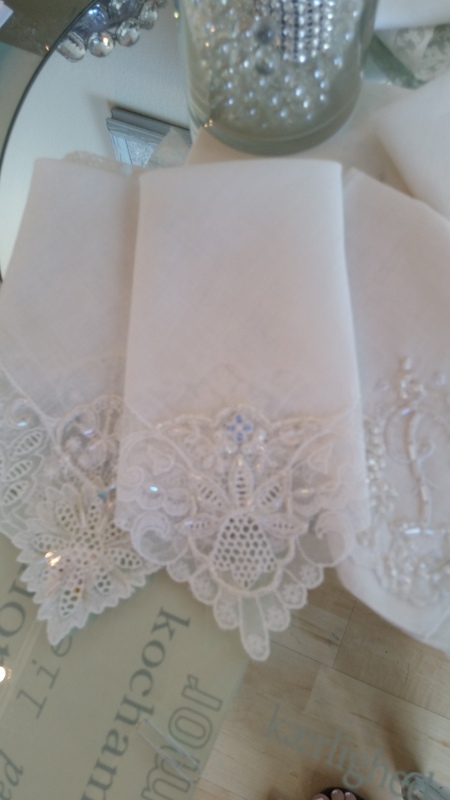 A beautiful hankie will collect those tears of joy and be a treasured heirloom that can be passed down as “something old” to a daughter or future daughter-in-law. Come by and see our offerings.